Is Bud Selig that much different than Ozzie Guillen? The Miami Marlins suspended Marlins manager Ozzie Guillen 5 games for praising Cuban Communist leader Fidel Castro in an interview published in Time Magazine. The Marlins skipper said he “loved” Castro. “I respect Fidel Castro. You know why? A lot of people have wanted to kill Fidel Castro for the last 60 years, but that [expletive] is still here.” The comments were insensitive to Cuban-Americans who were up in arms after hearing the remarks. Anyone who has followed Guillen’s managerial career should not be shocked or surprised by anything that he says, as this has been his M.O. since he first became a major league manager. He seems to always seek out controversy and isn’t happy until all the attention is on him and whatever he spewes out to the press on a given day. That’s what we know about Ozzie Guillen. But what about MLB commissioner Bud Selig? No, he hasn’t made his sentiments public with respect to how he feels about the famous dictator, at least not in words, but if actions truly speak louder than words, then he has already gone out of his way to pronounce himself ‘close enough’ to Castro to watch a baseball game sitting right along side of the bearded ruler. What could these two possibly have had to talk about? Maybe the commissioner was discussing how awful it is that many Cuban ballplayers have spent weeks on crafts as small as rowboats, with just the clothes on their backs, in order to flee the persecution they are under in Cuba, in order to find refuge in the U.S. Perhaps he was he chatting with Castro about the Cuban-Missle crisis of 1962 in which this country and the world came as close to the outbreak of WWIII as we ever have. We know that Selig didn’t need Castro’s support or endorsement of MLB; it was flourishing without the loud-mouthed dictator’s two cents and who would care what he said anyway? Since the release of Guillen’s comments to the public, Selig has stated to the press that he found the manager’s remarks concerning his praising of Castro to be ‘offensive’. Clearly it couldn’t have been that offensive to Selig. I mean after all didn’t he sit with the monster himself just 90 miles off the shores of Miami? If the word ‘hypocritical’ has crossed your mind, then you can plainly see how to some, what Ozzie Guillen said could be taken just as ‘offensively’ as what the commissioner did 13 years ago. What sort of punishment, if any, do you think the commissioner would have imposed on Guillen if it were left for him to do so? We’ll never know but really, is Bud Selig that much different than Ozzie Guillen? ← VIDEO OF THE WEEK-Reliever Ties 46 yr. Old Record! Very, very true. but then again this is the commish that volunteered the Brewers (then owned by his family) to move to the N.L. but leveraged a future All-Star game out of it. He then took that future All-Star game to the taxpaying public (or his family did that is) to get funding for a nice new stadium and then sold the team at a profit of a couple hundred million dollars. I never about this. Very interesting and at the same time, not the least bit surprising. Thanks for the info & for commenting! You made some great points. Selig sitting next to and talking with Castro is almos worse than Guillen’s comments. In order to make a fair judgment of Selig, I would have to know more about the circumstances of why Selig was in Cuba and why he was sitting with Castro. If Castro invited Selig to sit with him, I don’t know if you would want to give the man a flat “no” in response, since he is the recognized leader of the country and you’re just a guest there. Obviously there are some protocols that must be followed if you are conducting business in a foreign country. 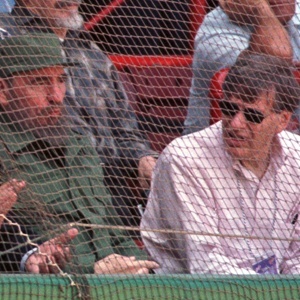 And in the picture it seems Selig is talking to the person on the right of Castro, and not Castro himself, so maybe he and Castro had very little to say to each other. Also, this photo was taken 13 years ago. But as for me, I doubt I would even go to Cuba as long as Castro is in power, so I wouldn’t put myself in a position to have to accept or decline his hopsitality. In MIami, the Cuban-American community was beyond outraged. 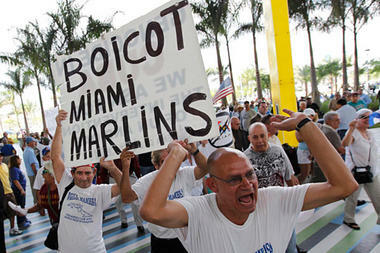 They claimed it was merely a propaganda coup for Castro & Cuba and that Angelos and Selig were made to look like fools. They were and are! Your last sentence however, says it all. Bud “See No Evil” Selig is nothing if not consistent though, you gotta admit. Well, in all honesty they didn’t have to as long as they read a newspaper or watched TV. Guillen might have lost part of the Miami community but as long as his players respond favorably to him he’ll be alright. I mean they never had decent attendences there so Ozzie needs to shut up win and hope the fans to show up. However one more real inane, inappropriate comment and I think his leash gets real short.